This highly popular resource - written in an easy-to-read style and format - delivers everything nurses and other health researchers need to know about designing, testing, selecting, and evaluating instruments and methods for measurement in nursing. The Fifth Edition features the most current content, strategies, and procedures available with direct applicability to nurses and health researchers engaging in interprofessional research, collaboration, education, and evidence-based practice. Five new chapters focus on challenges to using big data, evaluation and measurement in interprofessional practice and education, metrics and benchmarking in health professions education and practice, and measurement issues in translational science. 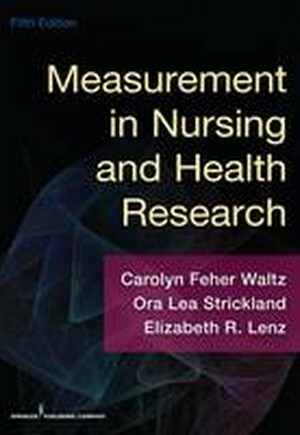 The book gives particular attention to measurement issues resulting from changes in nursing, health research, and the increased emphasis on and undertaking of interprofessional research and evaluation. Presenting the material in step-by-step format, the book is designed for readers with little or no experience in measurement, statistics, or interprofessional issues. It focuses on increasing the reader's ability to use measures that are operationalized within the context of theories and conceptual frameworks, derived from sound measurement principles and practices and adequately tested for reliability and validity. Additionally, the text provides a pragmatic account of the processes involved in all aspects of measurement. Studies conducted by nurses and researchers in varied settings illustrate the measurement processes.